Ok, so it's been a few months since Origins 2010, and it is only now that I am finally posting more information on my .45 Adventure scenario, Fight of the Flying Wing. I've been busy, but here it is, sort of. I'm terrible about taking pictures when I run a game at a convention. I try to stay focused on running the game. 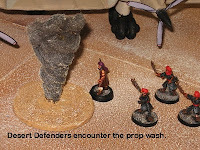 My usual assistants helped set up and pack up, but were off playing games of their own during the game. 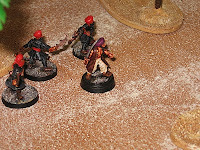 So what you see here are pictures from one of the games I ran on a typical game night with some set ups to recreate some of the Origin's game. It will give you a feel of the scenario. 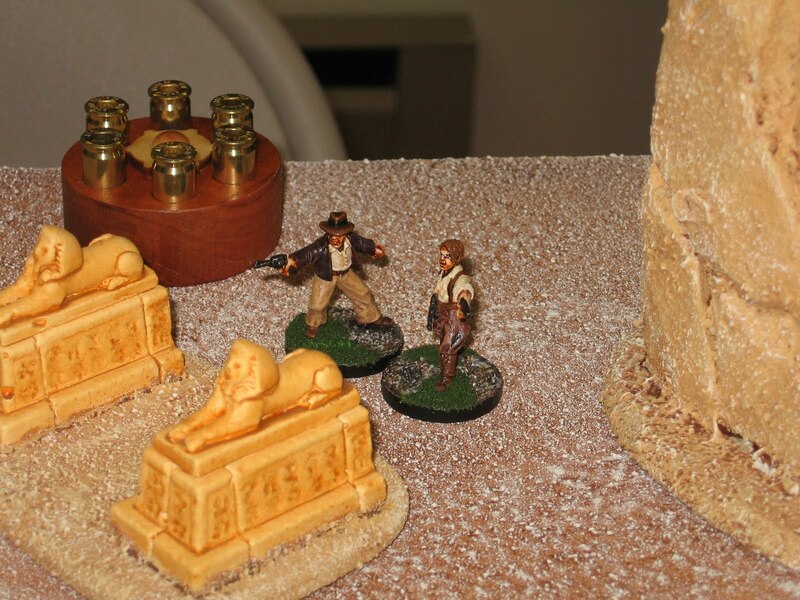 This was the second year that I have run an Indiana Jones flavored .45 Adventure's scenario at Origins. 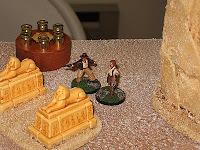 It was also the second year that my game was the only .45 Adventure game scheduled for Origins which was too bad. Both times my games have sold out with in a couple of hours of being posted. Both times I have had a good audience to watch, and lots of potential players waiting with their generic tickets in the hopes that a player won't show. I know it's not GenCon, but with around 12,000 attendance it isn't small either, and when you figure that only 1/3 of Origins attendees go to GenCon you are missing a lot of potential customers. Maybe next year. I am planning on taking both of my scenarios to Origins '11 and I have plans for a third - I hope. 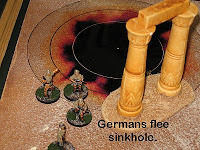 The scenario is not a strict recreation of the movie - that would only involve Indy and the Germans. 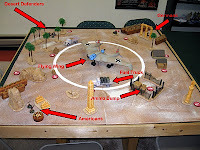 To make it a four player game I added another American and a group of Desert Defenders for a nod to the Mummy. 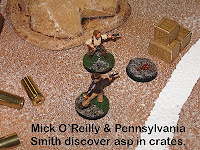 The Americans where Mick O'Reilly (another nod to the Mummy) and Pennsylvania Smith, both grade 3's. So the Americans were run by two players with a total team strength of six. The Germans were commanded by Maj. Oberst Unter (grade 3) with a commando team of three grade 1's. 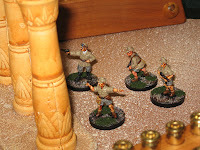 This was a rouge German team bent on earning points with Hitler by capturing the Ark for themselves, and thus were free to attack any German guards. 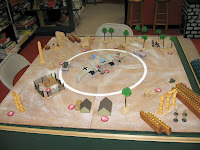 The Desert Defenders were lead by Hassen Ben Eezy (grade 3) and his team of three grade 1 henchmen. Their job was to protect the hiding place of the Ark and eliminate all witnesses. 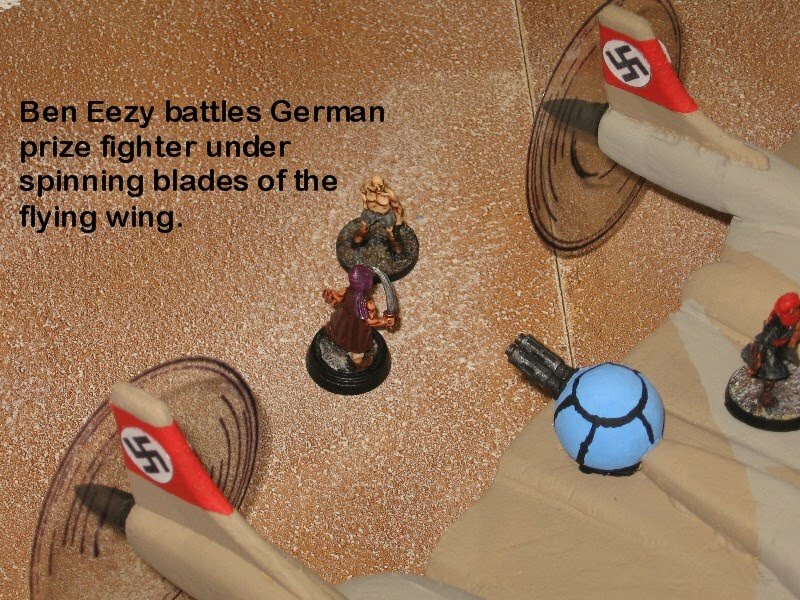 Add the German mechanic who is simply minding his own business tuning up the flying wing, the pilot, and of course the German sergeant/prize fighter asleep in the tent; these were for my to have some fun with. 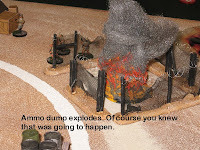 Scattered randomly about the field were some extra weapons (grenades, a panzerfaust, etc. ), a sink hole (Who thought it was a smart idea to build an airfield on top of some ancient ruins?) asps (Snakes - why'd it have to be snakes?) a short lived dust devil/prop wash, and of course the Ark. 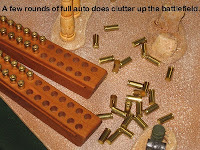 Plus a mix of blanks and some other useful items. I don't want to give to much away. 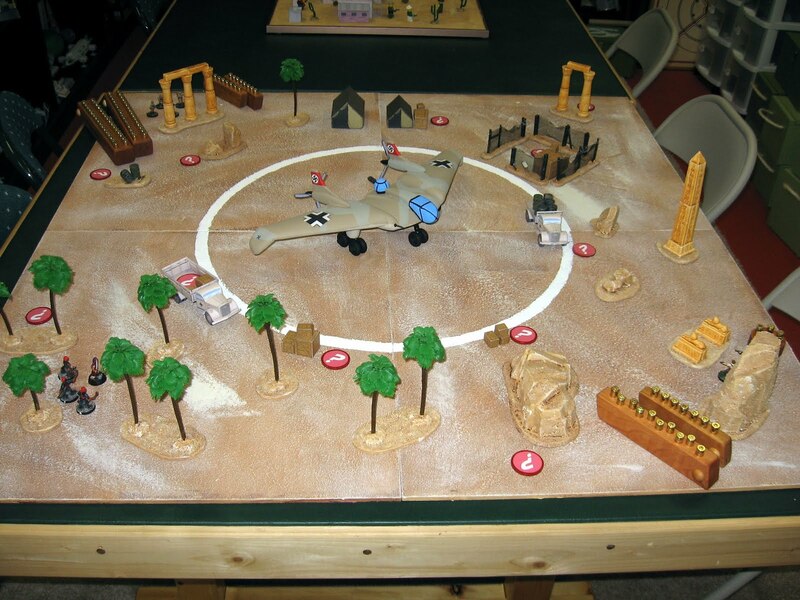 The big attention grabber was the flying wing. Not a great model, I only made it out of a chunk of Styrofoam, some cardboard, a few bit from my bit box, and some wooden wheels. It is roughly to scale with the exception of the wheel - I used ones large enough to move minis under the model without needing to lay them down. The props are held on with magnets so that they can be changed for spinning prop discs when the engines come on. I also made some wheel block that need to be removed and double as weapons. 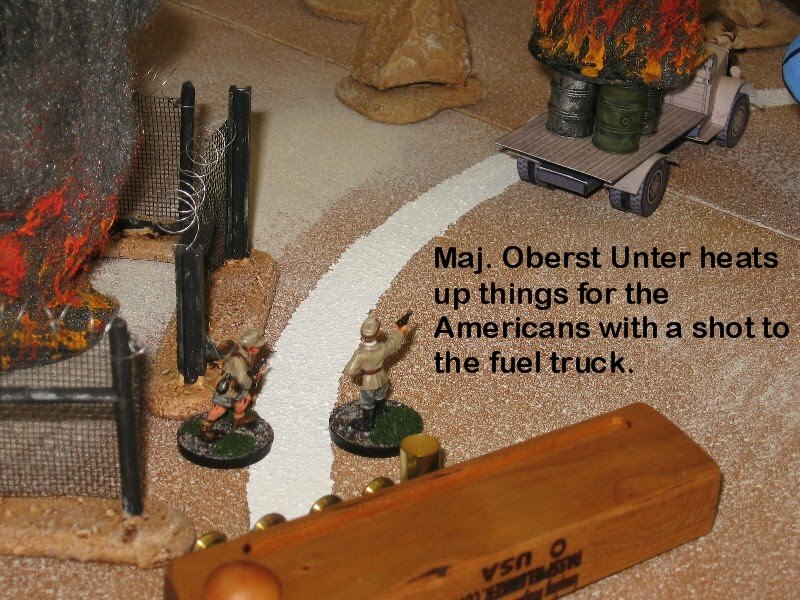 In every game I've run the mechanic always gets pushed back into the prop. 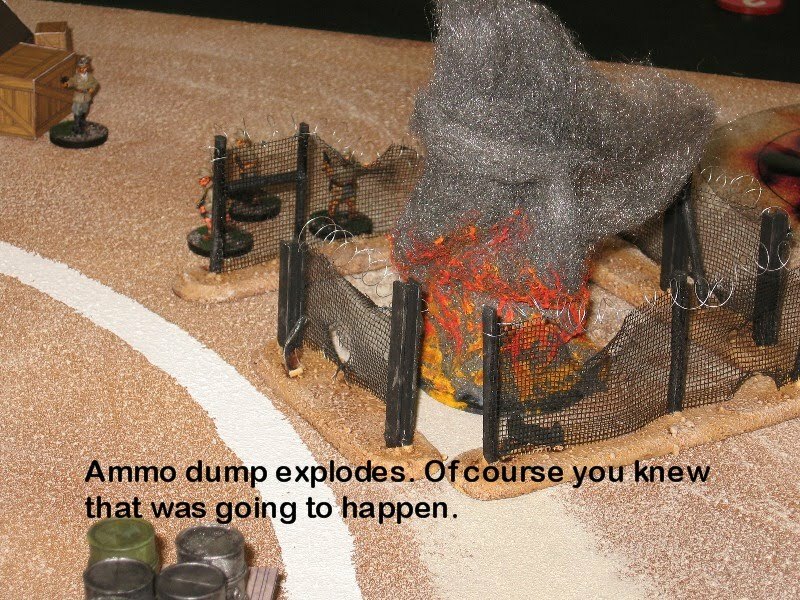 This year I used the AmmoCounters which added a great visual to the game, plus the fun of having the players ammo run down. They really brought a lot of additional attention to the game. 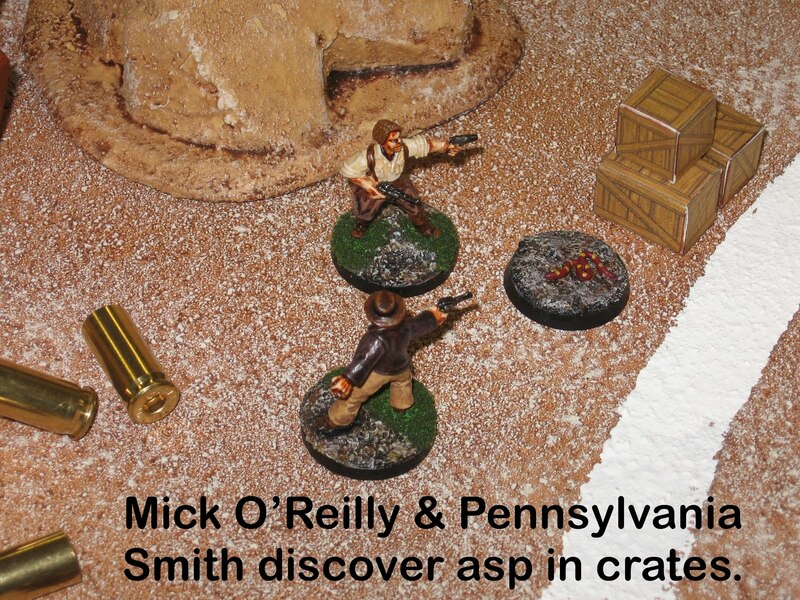 Each gun had it's own type of counter, from Pennsylvania's revolver, to the German Luggers, to the submachine guns. 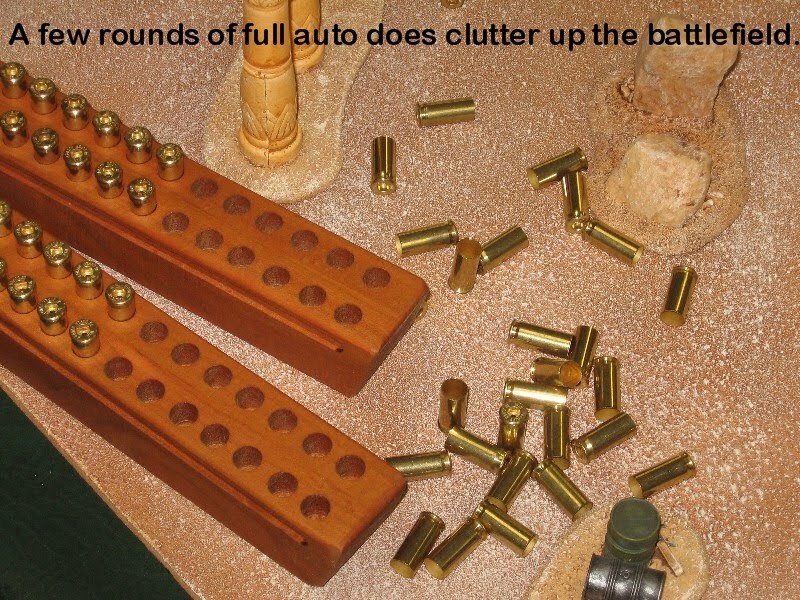 They don't really make .45 Adventures more difficult to run - you just take out bullets as you roll shots. And the sound of all the brass hitting the pile is cool. So that's it for Origins '10. 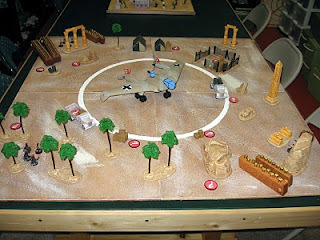 Those of you that got to play, thanks for a fun game and I hope to see you at Origins '11.